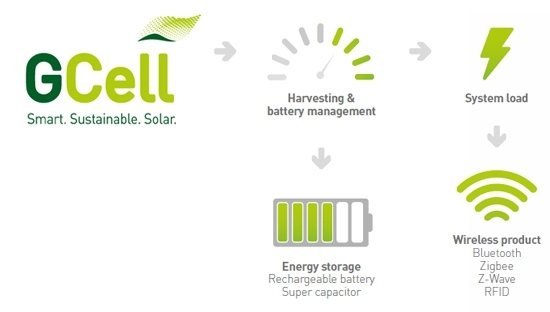 Energy storage as part of an Energy Harvesting (EH) system is an important consideration when integrating GCell to your application. Our engineers are experienced in the design and specification of Energy Harvesting systems with a particular proficiency in pairing energy storage devices with indoor solar modules. Through continuous professional development they ensure they have a first hand understanding of the latest developments in battery technologies, supercapacitors and other storage options available. LSD NiMH batteries are well suited to product applications with heavy energy usage or in which the GCell function is to extend the product runtime beyond the required product life. In these products the GCell provides the system standby and light usage and the LSD NiMH batteries provide any heavy system loading. The battery has a low self discharge rate so is well suited to many consumer electronic products which may have long-term shipping or storage. ML batteries are very well suited to indoor solar products that have light energy loading. These may be products using GCell in conjunction with electronic displays in Electronic Shelf Labels (ESL) or retail signage (Point of Purchase) applications. The ML battery has a very good self discharge rate so minimal energy is lost from the battery. The limiting factor for the ML battery is the lower instantaneous discharge current limit. This can limit the use in wireless communication products that require a higher instantaneous discharge current during transmit and receive sequences like Bluetooth and Zigbee. The battery can be used in conjunction with Super Capacitors to improve the discharge performance, but the system cost and overall leakage needs to be considered. LiFePO4 batteries are well suited to many medium to light load usage application in conjunction with GCell modules. In comparison to Lithium Polymer and Lithium Ion, LiFePO4 have a higher cycle life and maximum instantaneous discharge current rate. They have a lower energy density which results in a bigger form factor for like-for-like capacity comparisons, but they have the advantage of a lower self discharge rate and increased safety over other comparable lithium battery types. Â FLCB is a solid state battery technology that is manufactured based on Flexible Printed Circuit (FPC) manufacturing process and base materials. The battery is flexible and can be combined with the GCell in thin or flexible product applications. Solid state batteries are an emerging battery technology. They are well suited to EH applications as they can be charged in very low light conditions by the GCell. They also have a very high cycle life due to using a solid state electrolyte. Being a new battery technology the cost in relatively high in comparison to other commercially available battery types. Supercapacitors are very well suited to energy harvesting applications by GCell modules where the energy storage acts as a buffer to cover peak system loads. The high cycle life of Super Capacitors also makes them most suitable for applications where a continual charge and discharge cycle is required.